The most wonderful time of the year is just around the corner! I am participating in my favorite holiday market again this year, BAZAART at the American Visionary Art Museum in Baltimore. Featuring original creations by over 40 regional artists and craftspeople, including paintings, sculpture, paper crafts, metalwork, jewelry, textiles, mixed media, apparel, and other work that simply defies categorization! Shop local on Small Business Saturday! 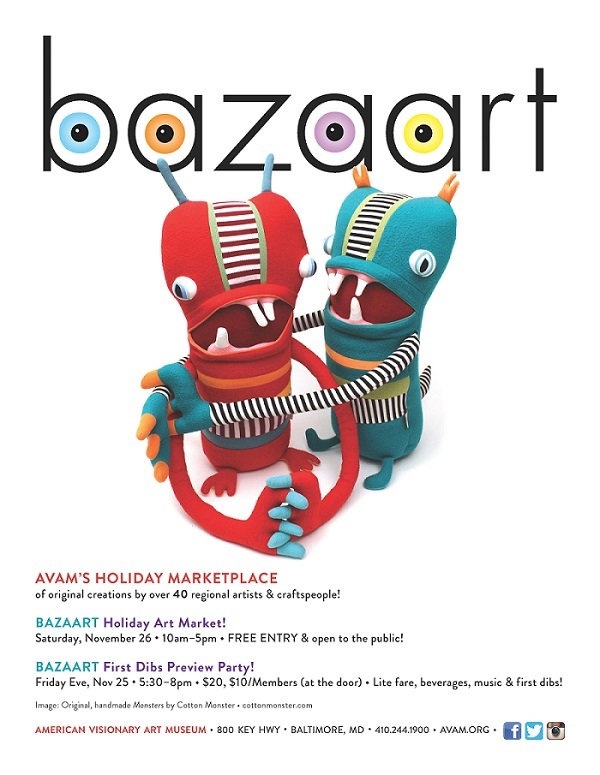 BAZAART is held at AVAM’s Jim Rouse Visionary Center, 3rd Floor, 800 Key Highway. The main event with free entry is held on Saturday, November 26, 2016, 10:00-5:00 pm. Or beat the crowds at the First Dibs Preview Party on Friday, November 25th 5:30-8:00 pm. Admission is just $20 ($10 for Members) for the Preview Party and benefits AVAM!